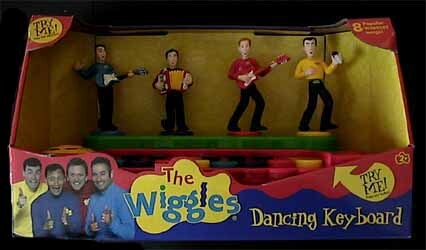 The Wiggles Dancing Keyboard is possibly the best product in the Wiggles range of toys for pre-school children, as it actually allows them to create their own music, or sit back and listen to one of eight catchy tunes. While the other Wiggles toys are great, this is one of the few items that allows the young to actually experiment with music for themselves. I have to admit, sad as I am, that one of the first things I did was attempt to play Happy Birthday, Twinkle, Twinkle Little Star and Chopsticks - although the later was impossible due to the fact that when you press down two keys at once you don't hear both notes. But then what are you expecting for £20? Your little one needs to walk before they can run. And if they show some creative talent with this toy you can always pick them up something a bit more complex. Each key on the keyboard is colour co-ordinated to one of the main characters colours (blue, purple, red or yellow) if you press a yellow key, not only does the keyboard play a note, but the corresponding character will raise up in the air. If your little one is not quite at the level where they can turn out a mini masterpiece, then they can push one of the four characters down. This will result in a different song being played - there are two for each character. 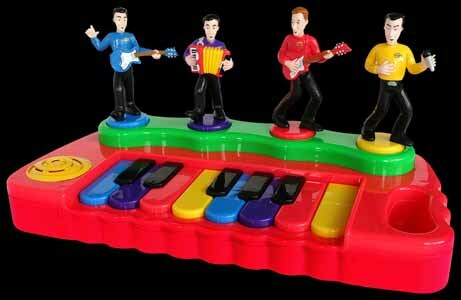 As I mentioned earlier, this is by far the best musical item in The Wiggles range. This is an item you can buy for a really young child, that will grow as the child grows... Heck, it kept me amused for hours and I'm in my 30's.